If follow this blog at all, you know I am not fond of the black IPA name. Why so? Because I think it's an insult to the English language. IPA nominally stands for India PALE Ale. Pale typically means light in color. How can you have a black pale ale? The answer is simple: You can't. It doesn't make sense. So why are some breweries creating black IPAs? I suspect there are many reasons. But the most logical explanation is they wish to capitalize on the popularity of IPA while producing a darker beer. This is especially true during the winter months, when patrons are accustomed to drinking darker brews. Of course, some brewers recognized the fallacy of the black IPA name long ago. They have steered away from it. That doesn't mean they're steering away from the style. But the beers in this segment are increasingly known as Cascadian Dark Ales (CDA) or Dark IPAs. Makes more sense. Readers unfamiliar with this style can find a fairly compact discussion here. Matt Van Wyk, brewmaster at Oakshire Brewing in Eugene, talks about the confusing nature of the naming nomenclature and also looks at the characteristics of the style. Worthwhile reading, for sure. Briefly, Cascadian Dark Ale or Black Ale or Dark Ale is a moderately hoppy beer with a medium malt backbone and a dark complexion. Significantly, the style does not possess the strong roasted malt character of a stout or strong ale. CDA leans heavily on hop aroma and flavor, with mild bitterness (50-70 IBU). The style is an expanding segment. Here in Oregon, it is well-represented by Deschutes (Hop in the Dark) Widmer (Pitch Black IPA), Hopworks (Secession CDA), Bridgeport (Black Rain), Oakshire (CDA), Full Sail (Bump in the Night) and many others. I took some time to taste a couple of CDAs this week. Let me back up. Pyramid Brewing has taken a beating for what I would describe as "off branding" in recent years. No need to go into significant detail, as the shortcomings of the rebranding that took place in 2009 have been well-documented. If you want to know more, Jeff Alworth (Beervana) does a nice job here. Look for this label on store shelves! 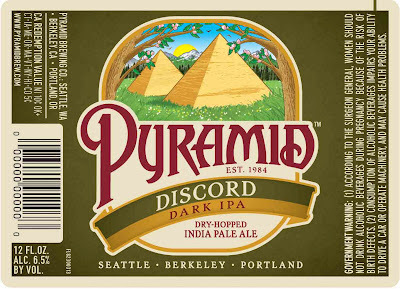 The basic premise going forward is that Pyramid has returned to its roots with its beers and branding. You'll notice the packaging has returned from oblivion by dumping the neon colors and what Jeff describes as "cringe-inducing names." You'll now see more traditional artwork, retro even. Same goes for the beer names. Anyway, Discord is a very nice beer. It may not be a big as some of the tweaked versions of the style, but it's quite good. 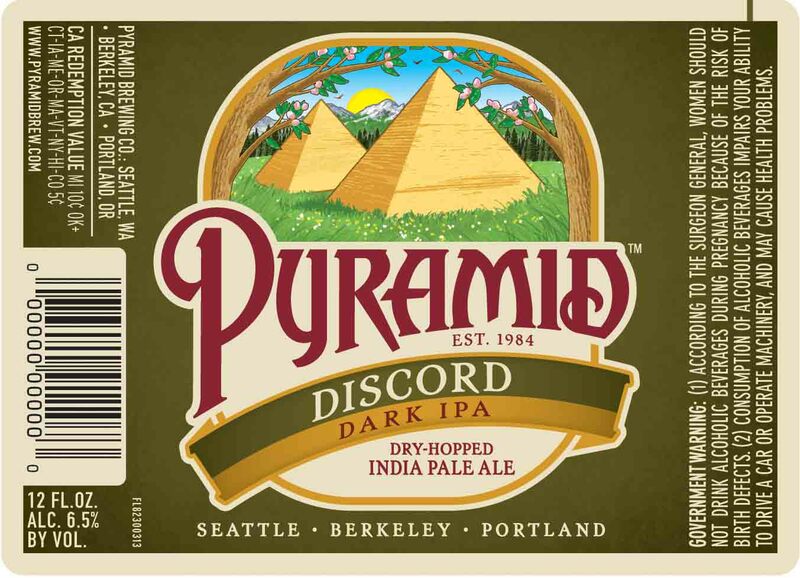 The Pyramid brewers use four hops for bittering and flavor, three more for dry-hopping. Discord comes in at 6.5% ABV and 69 IBU. The bad news is this beer will only be available through the end of March. My advice is to go forth and find it. Even if you are only a middling fan of the style, you will love this beer. It's a great beer and a great value. On a quick trip to Freddy Meyer and I found Discord bombers for $2.47; six packs were on sale for $7.99. 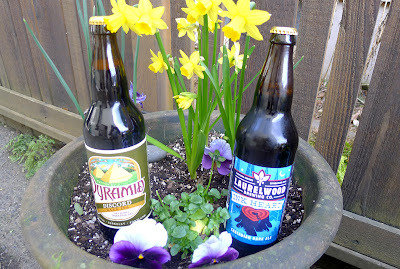 Laurelwood, which is in my hood, hasn't had branding challenges like Pyramid. They've got a rather earthy brand presence, as suggested by apparel that features chickens, trees and a lot of organic messaging. They have also built a solid portfolio of standard beers, including Workhorse IPA, Free Range Red, Tree Hugger Porter and Space Stout. 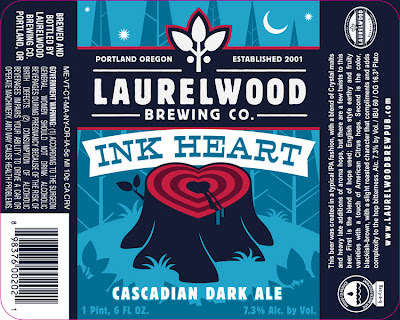 If you're keeping track at home, you can add Ink Heart CDA to the Laurelwood beer line. This is one of their seasonal offerings, and should be available now through the end of May. Ink Heart is a well-balanced beer. It's deep brown in color, but really has none of the harsh roasted flavor you might expect. Hops are present in the nose and flavor; bitterness is restrained. 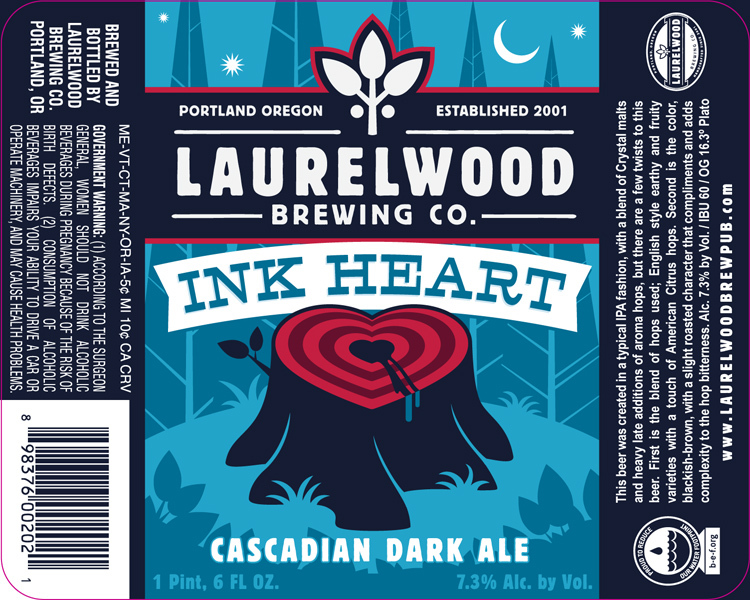 Laurelwood brewmaster, Vasili Gletsoes, says they used Midnight Wheat malt in Ink Heart. Midnight Wheat has no husk, and it is the husk that often produces harsh bitterness in darker beers. Indeed, Midnight Wheat was designed specifically for the CDA style. It adds color and head retention, without imparting harsh flavors. Can you say smooth beer? As for the hops, they used a combination of English and American hops to create an earthy, citrus profile. The actual hops used: Columbus, Northern Brewer, Kent Golding, Simcoe and Amarillo. Ink Heart stats: 7.3% ABV, 60 IBU. Ink Heart will be available on draft here and there around town. Baileys tapped a Firkin on Thursday evening, Vasili told me. You'll be able to find it in bottleshops, as well as New Seasons and Whole Foods. Some Freddy Meyer locations will also have it, depending on what kind of beer selection they have. Find these beers. They won't disappoint.